Here at The Escapist, we like to celebrate big anniversaries for influential games. In February, we celebrated the 20th Anniversary of Pokemon and the 30th Anniversary of The Legend of Zelda. In March, we focused on the 20th Anniversary of Resident Evil. Other major anniversaries coming up are Sonic the Hedgehog, Metroid, and Castlevania. But today? 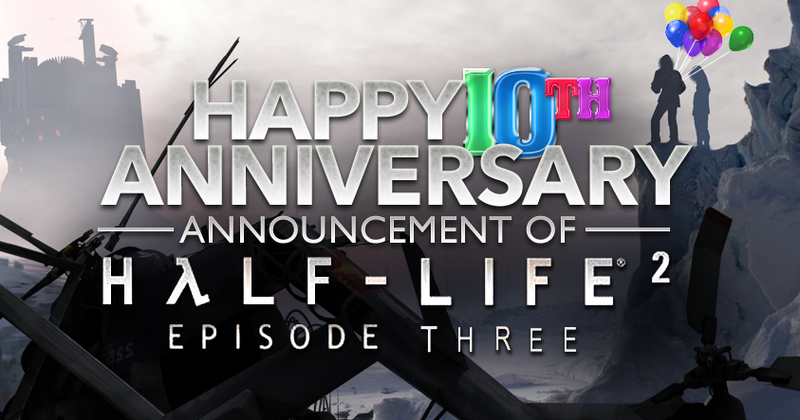 Today we have something extra special for you - we're celebrating the 10th Anniversary of the day that Half-Life 2: Episode Three was announced. Half-Life, released on November 19, 1998, was the debut title from Valve Software. It racked up more than 50 Game of the Year awards, and has been hailed as one of the greatest, and most influential, video games of all time. A trio of expansions followed: Half-Life: Opposing Force, Half-Life: Blue Shift, and Half-Life: Decay. The franchise moved on to its second main installment, Half-Life 2. The sequel had a six-year development cycle, with several leaks and multiple delays, but finally released in 2004 to overwhelmingly positive reviews and its own impressive collection of Game of the Year honors. In 2006, Half-Life returned, with Valve taking gamers on a journey of episodic adventures. Two episodic adventures, to be exact. Half-Life 2: Episode One released in June 2006, with Episode Two releasing in October of the following year. Prior to the release of the first Episode, however, the ground was laid for a trilogy. Half-Life 2: Episode Three was officially announced ten years ago today, May 24, 2006, with Valve saying that it was the last "in a trilogy...that will conclude by Christmas of 2007." The following June, Gabe Newell referred to Half-Life 2 Episodes One through Three as simply Half-Life 3. In October of 2008, Valve marketing VP Doug Lombardi said that the reason development on Episode 3 was so slow was the result of the company focusing on its other games, but also that the team wanted the third episode to be "really big." One of the only recurring complaints about the first two installments was the relatively small size, and Lombardi said that the team was taking its time because "it's a more ambitious project." That interview was one of the final times Half-Life 2: Episode Three was directly discussed by anyone associated with Valve. It was as if a great tragedy had befallen the team, and silence was encouraged out of respect for the fallen. That silence has been broken only by hopes and hoaxes. Last week, YouTuber CrowbCat shared a compilation of interviews showing how Newell became tight-lipped about the third episode in 2008, increasingly so as the years progressed. Half-Life 3 has, over the course of the past decade, become the holy grail of the PC gaming community. It's current state is both legend and urban legend, spoken of in hushed whispers and dank memes. Most of the information that has circulated during that period of time has been the result of unsubstantiated rumors. Every year, fans wait with bated breath when E3 comes around, only to step away with a sigh and a sad smile as yet another year passes with no word of the newest Half-Life adventure. For 10 years, people have found code in other games, read leaks that say that Valve is ditching episodic content and creating a full Half-Life 3, listened to teases of a jump to VR, and pleaded passionately for some sort of finality, either in the delivery of the game or confirmation that we will never see it. All they have for their troubles are a few pieces of concept art and a Half-Life 3-shaped hole in their souls. The sentence "Half-Life 3 Confirmed" itself is equal parts meme and dream. The phrase is nearly synonymous with "April Fools," and yet it is still one that journalists dream of typing, fans dream of reading, and Gabe Newell probably dreams of never being asked about ever again. Half-Life 3 in 2016 means something different to everyone, and if you're reading this article, it's possible that it means something to you, too. What began as the promise of a game has, over time, come to represent something more. Maybe Half-Life 3 was never a game at all, but rather a feeling. Maybe we all carry a piece of Half-Life 3 inside of us. It is the sun on our backs and the love in our hearts. It is a bastion of light in a cruel, dark world. It is a fire burning bright, a hope that links us together in laughter and tears, optimism and despair, forever serving as a reminder that we are not alone. Half-Life 3 isn't a destination - it's a journey, and the friends you made on that journey. Unless it comes out one day. Then I take all of that back.